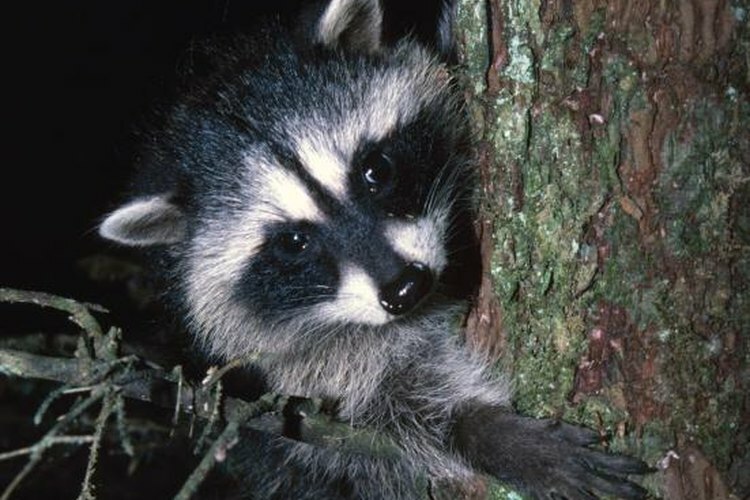 Because raccoons are nocturnal and most likely to be trapped at night, check your traps each morning. Although they are some of the cleverest critters in the forest, raccoons are susceptible to snare traps if they are properly constructed and placed in a suitable location. You can construct a snare from little more than a length of wire and a stake, but they often sustain damage during use, necessitating replacement or repair. Commercially manufactured snares are available, but it is easy to make your own. Cut a 6-foot-long section of aircraft cable using the measuring tape and wire cutters. Slide the cable through one side of an aluminum ferrule, through the small hole in the snare lock and back through the empty side of the aluminum ferrule. Crimp the ferrule into place using the crimping tool. Pass the opposite end of the aircraft cable through the large opening of the snare lock to form the loop. Pass the free end of the cable through one side of a ferrule, through the small hole of the swivel and through the empty side of the ferrule. Tighten the loop and crimp the ferrule into place with the crimping tool. Cut a 1-foot-long length of cable by using the wire cutters and measuring tape. Pass one end of the cable through a ferrule, wrap it around the stake -- or pass it through the eye of the stake if it is so equipped – and back through the ferrule. Crimp the ferrule with the crimping tool. Pass the other end of the cable through a ferrule, then the large loop of the swivel and back through the ferrule. Crimp the ferrule with the crimping tool to complete the task. Placement is key when using a snare trap to harvest raccoons. They rarely work well when used in conjunction with baits or lures. Instead, try to place them along well-worn game trails frequented by raccoons. The best way to trap raccoons is by noosing them around the neck. When setting the snare, drive the stake into the ground. Place the loop in the trail and adjust the loop so that it is about 8 inches in diameter. Place it vertically, about 3 inches off the ground. Use sticks to keep the snare in place until the raccoon puts his head through it. Always comply with local trapping laws and regulations. Snare traps are not legal in some areas. Snare traps are not always lethal, so check them frequently and be prepared to kill the raccoon humanely once you return. Wild-About-Trapping.com: What Is a Snare?